Short break from your daily routine Although in the calendar, spring starts in mid March, it often seems to take forever until the first warmer days arrive. If you do not want to wait any longer, simply sail away from your daily chores and enjoy a long weekend at sea. 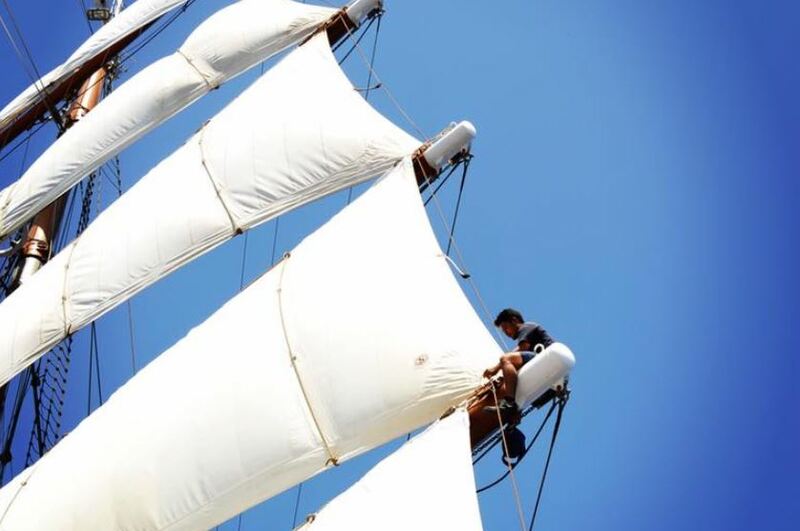 On board our windjammer it is easy to unwind and take in the fresh breeze and sunshine. Portofino, de luxe fishing village Here, you’d hardly be surprised if Sophia Loren and Grace Kelly strolled past. With its quaint lanes and brilliant houses that compete in shades of dusky pink, rusty red and ochre yellow, Portofino has been drawing the international jetset since the nineteen-fifties. The Piazzetta by the harbour offers the best views of white yachts, colourful fishing boats and elegant boutiques. Menton, sweet town of lemons Where Nice and Cannes show off, Menton impresses with elegant restraint. The sweet little town on the Eastern Côte d’Azur is a lot less touristy than its flashy neighbours, enchanting visitors with Italian flair and pastelcoloured facades in its old town. As the legendary town of lemons, Menton is living proof of how wonderfully sour “la dolce vita” can be. Guaranteed cabins. 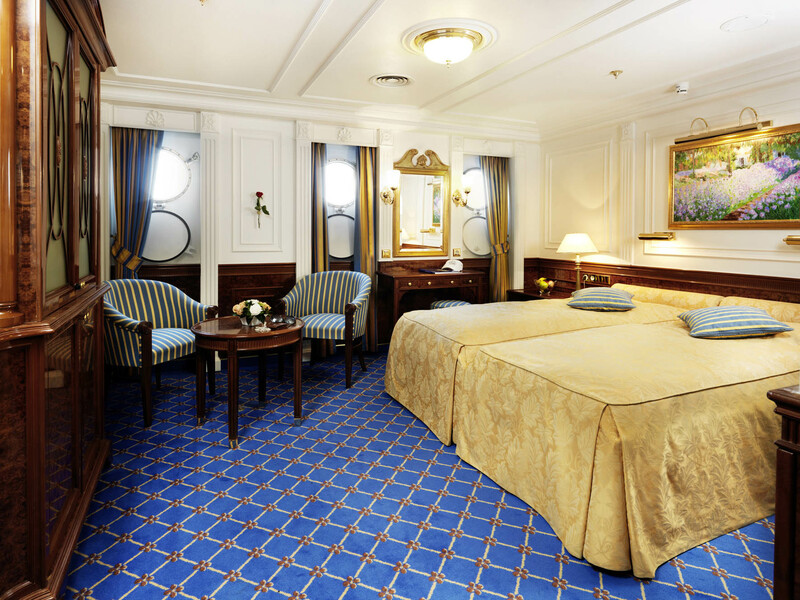 With a guaranteed cabin, you pay the lowest rate, but you leave the choice of cabin down to us. You will receive the cabin number with your cruise documents. The range of accommodation starts from Cat. F. The allotment for these categories is very limited. All the cabins have small sitting areas, a bright ambience, brightly coloured, spacious marble baths and plenty of space for all your personal belongings. No matter which cabin you choose, the cabin service will provide everything you need. Your pretty maritime home is tidied twice a day, the fruit bowl is refilled, and the daily programme is left out for you to read (not to mention all the extra little touches...). All the cabins have small sitting areas, a bright ambience, brightly coloured, spacious marble baths and plenty of space for all your personal belongings. No matter which cabin you choose, the cabin service will provide everything you need. Your pretty maritime home is tidied twice a day, the fruit bowl is refilled, and the daily programme is left out for you to read (not to mention all the extra little touches...). These cabins are in the traditional windjammer style with upper and lower beds. They are located on the Cabin Deck. Cabin size:	Approx. 14 m². Furnishings:	Two portholes, chair, table, TV with DVD player, mini-bar, dressing table, closet, safe, adjustable A/C Bed:	Upper and lower single beds (90 cm x 200 cm) Bathroom:	Approx. 3 m² with shower, WC, marble sink, golden fixtures, hair dryer, outlet for razor. All the cabins have small sitting areas, a bright ambience, brightly coloured, spacious marble baths and plenty of space for all your personal belongings. No matter which cabin you choose, the cabin service will provide everything you need. Your pretty maritime home is tidied twice a day, the fruit bowl is refilled, and the daily programme is left out for you to read (not to mention all the extra little touches...). The comfortable cabins in Category E are located on the Cabin Deck, where the hospital, sauna, swim platform and fitness area can be found. Cabin size:	No. 207-210 approx. 19 m². No. 211-217, 224-231 approx. 20 m². Furnishings:	Two portholes, sofa, table, TV with DVD player, mini-bar, dressing table, closet, safe, adjustable A/C Bed:	Queen size bed (180 cm x 200 cm); can be separated into two single beds Bathroom:	Approx. 3 m² with shower, WC, marble sink, golden fixtures, hair dryer, outlet for razor. All the cabins have small sitting areas, a bright ambience, brightly coloured, spacious marble baths and plenty of space for all your personal belongings. No matter which cabin you choose, the cabin service will provide everything you need. Your pretty maritime home is tidied twice a day, the fruit bowl is refilled, and the daily programme is left out for you to read (not to mention all the extra little touches...). 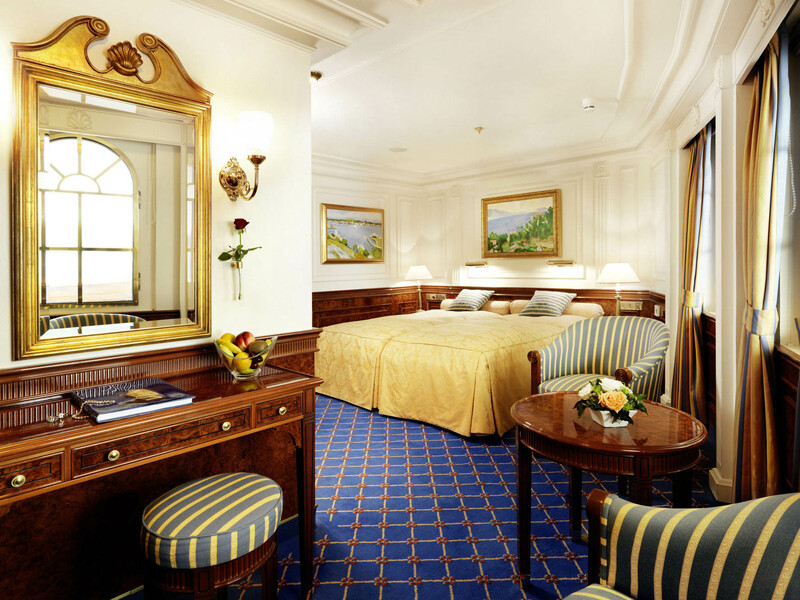 The Category C deluxe double-bed cabins are located on the Promenade Deck, where the restaurant, boutique and the reception can be found. Cabin size:	Approx. 20 m². Furnishings:	Panorama windows, two chairs, table, TV with DVD player, mini-bar, dressing table, closet, safe, adjustable A/C. Bed:	Queen size bed (180 cm x 200 cm) with two separate mattresses Bathroom:	Approx. 3 m² with shower, WC, marble sink, golden fixtures, hair dryer, outlet for razor. All the cabins have small sitting areas, a bright ambience, brightly coloured, spacious marble baths and plenty of space for all your personal belongings. No matter which cabin you choose, the cabin service will provide everything you need. Your pretty maritime home is tidied twice a day, the fruit bowl is refilled, and the daily programme is left out for you to read (not to mention all the extra little touches...). 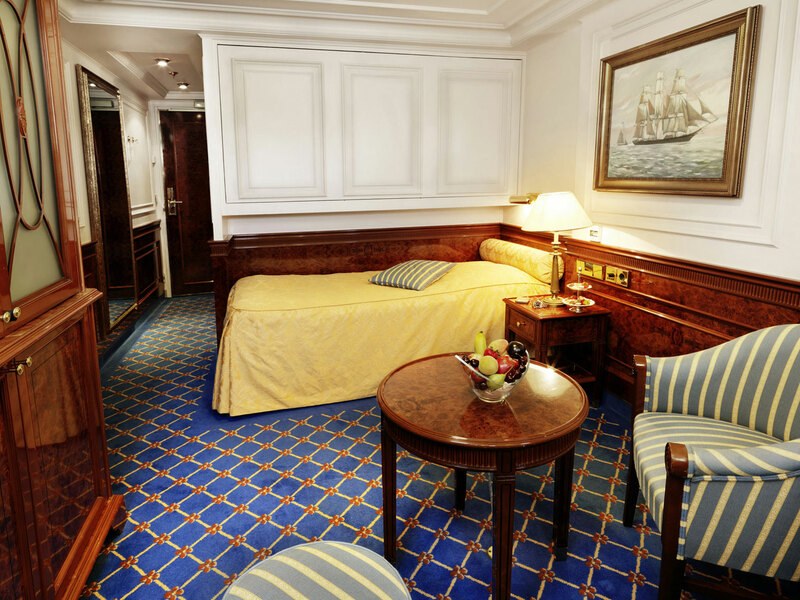 The spacious junior suites are conveniently located on the Promenade Deck, where the restaurant, boutique, and the reception can be found. Cabin size:	No. 303 approx. 22 m², No. 304 approx. 21,5 m², No. 305-319 approx. 23 m². Furnishings:	Panorama window, seating area, decorative fireplace, console with TV/DVD and mini-bar, dressing table, walk-in closet, safe, adjustable A/C. Bed:	Queen size bed (180 cm x 200 cm) with two separate mattresses; can be separated into two single beds. Bathroom:	Approx. 3,2 m² with tub, WC, marble sink, golden fixtures, hair dryer, outlet for razor. Although Elba is only a small Tuscan island, you will be surprised by how diverse it is. Imposing cliffs, white sandy beaches, avenues of cypresses, vineyards and olive groves, traditional villages and elegant beach resorts make the place of Napoleon's exile somewhere you would in fact like to be banished for longer. The beautiful old town of Portoferraio with its narrow streets of steps and medieval fortress is set high up on a rocky headland. In the enchanting town of Porto Azzurro, the palm-lined promenades, charming piazzas and small beach are at the centre of the town's activities. Portofino has a prominent position on a peninsula on the Italian Riviera and, since the 1950s, has developed into an elegant marina. The "dolce vita" seems to have been born here. You can unwind in classy bars and cafés in front of beautifully restored facades, browse for treasures in the backstreets and observe the comings and goings on the port's promenade. At first glance, Portofino is a picturesque fishing village. However, you will soon notice that it is also a sophisticated retreat for exclusive megayachts, as well as a great hideaway for anyone who knows how to enjoy the charming and stylish traditional atmosphere. Nice lies in one of the world's most lavishly endowed natural landscapes. The sea glows azure and the mountains in the background rise picturesquely up into the sky. Castle Hill gives you a fantastic view over the rambling old town - a labyrinth of alleyways with Baroque churches, pastel-coloured houses and red-tiled roofs. The Promenade des Anglais, a sophisticated, five-kilometre-(3 miles)long walkway along the magnificent Baie des Anges and its long beach, lies at the heart of the elegant new town, with its splendid palaces and aristocratic hotels in the Belle-Époque and Art Deco styles. Vessel Type: Tall Ship (Sailing) Length: 105 metres Passenger Capacity: 96 Built: 2001 Launched in 2001, Sea Cloud II is a stunning vessel, built along traditional lines, but offering deluxe accommodation. 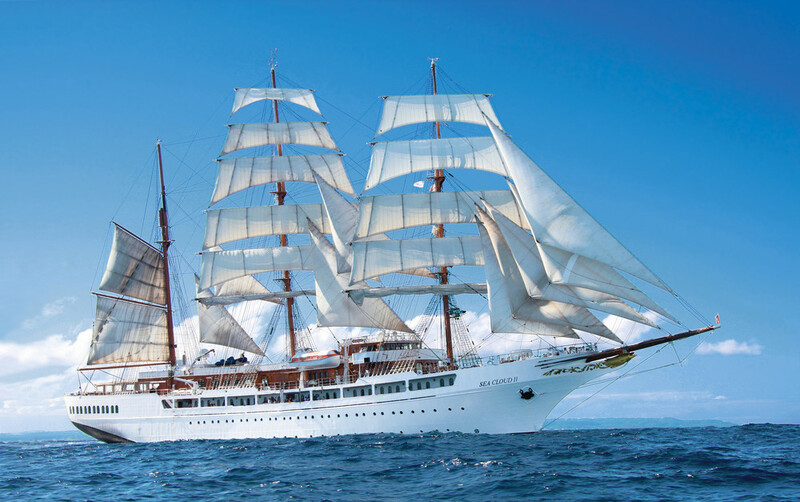 She combines timeless elegance of sailing ships of the past with the highest safety standards and the luxurious comfort of modern cruise ships. Just like her legendary sister ship Sea Cloud, the 29,600 square feet of sails is set by hand which is a truly magical sight. 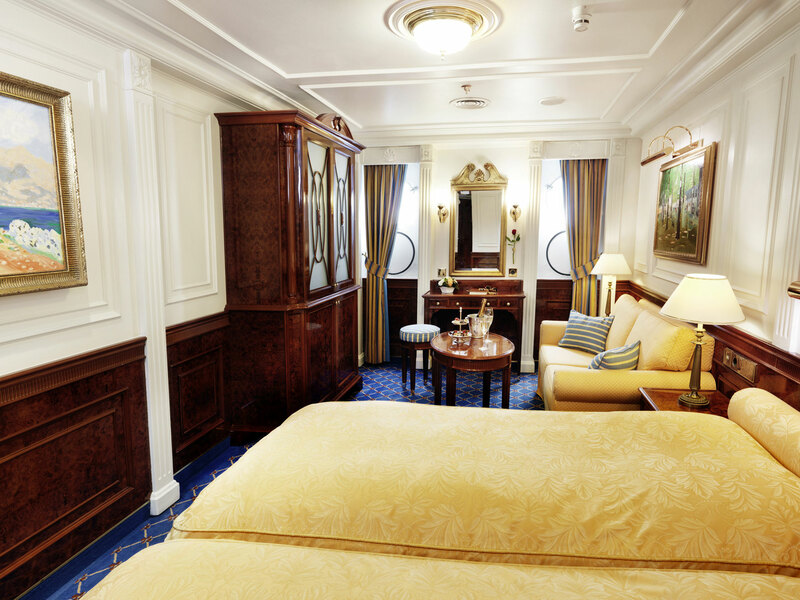 Built to accommodate 96 passengers in five star luxury, she offers a range of beautifully appointed suites and cabins which are furnished with great style. All accommodations have outside views and the bathrooms, in light marble, are unusually spacious and extremely comfortable. The finest, carefully chosen fabrics, combined with leather, rattan and other materials, brass and gold, precious woods and marble together create an impressive ensemble. 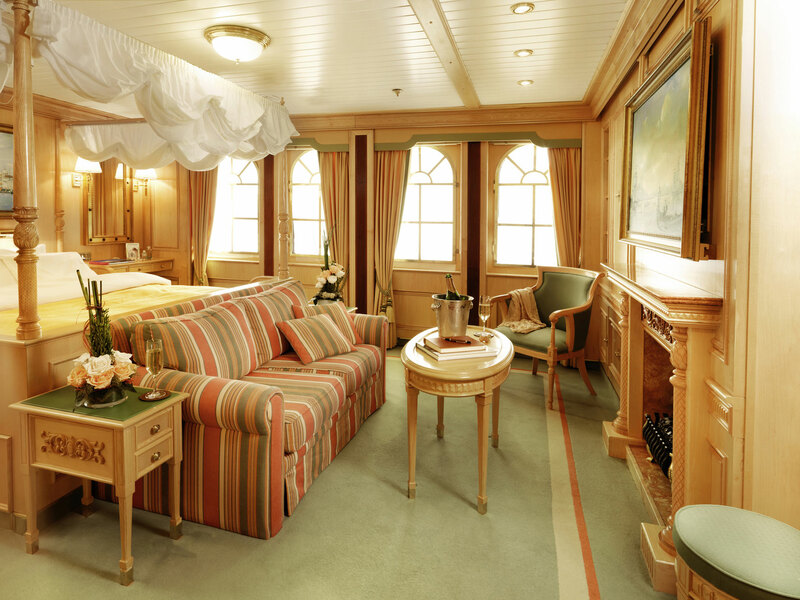 No expense has been spared to create a sympathetic ambience in both the accommodations and public areas and this is reflected throughout the vessel. Public areas include an elegant lounge, library, fitness centre, boutique, lido bar and hospital. The single sitting dining room is airy and modern and the quality of the cuisine and service will be to the highest of standards, as one would expect on a Sea Cloud cruise. Relax on the Lido deck and experience the natural grandeur of travelling under sail, rekindling memories of a bygone age. Please note deck and suite plans are indicative only and may vary slightly. 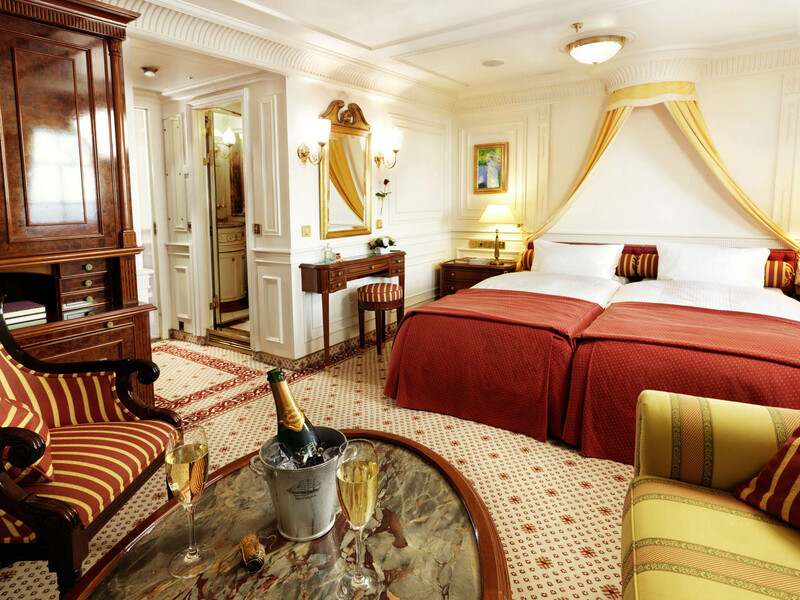 Book by 30 November 2018 and receive special savings on your 2019 voyages. Terms and Conditions apply, special offer is subject to availability, please contact us for more details.